Traditional methods of de-icing roads involve pouring some kind of chemical onto the surface: effective, but also time-consuming, and expensive down the line. Pumping electricity through concrete isn’t the most intuitive solution, but it could be surprisingly effective. Chris Tuan, a University of Nebraska engineering professor, has created his own special mix of conductive concrete, currently being trialled by the FAA for use in airports. It incorporates a 20 percent blend of steel shavings and carbon particles into regular concrete, which allows the mix to conduct electricity, generating heat and melting any ice. 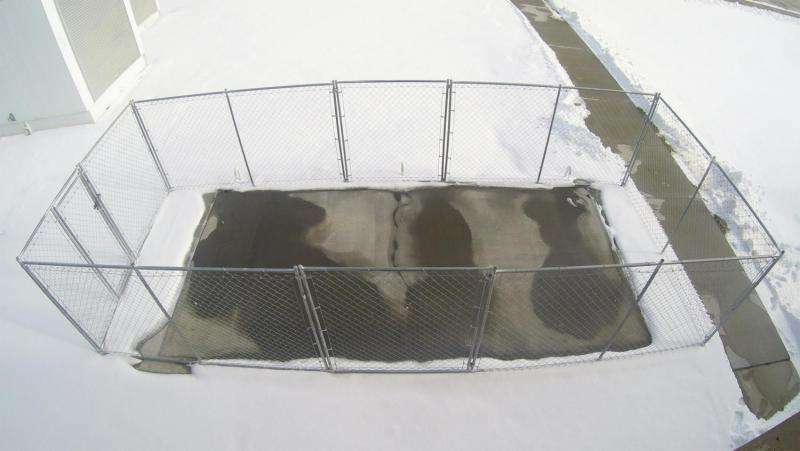 A small patch is currently being trialled in Omaha by the FAA; if all goes well, the concrete would be integrated into a US airport for further testing. The benefits are obvious: rather than needing to send gritting trucks around after every snowfall, you just let the concrete de-ice itself. The upfront cost of ripping up roadways and installing special concrete is likely to be enormous, but de-icing chemicals are hugely expensive in the long run themselves. Forget about the cost-per-truck of de-icing for a second: salt corrodes bridges, causes potholes, rusts cars, destroys plants, and messes up groundwater and wildlife, all to the tune of several billion dollars per year. There’s other potential benefits to eletrifying roadways: with the infrastructure for de-icing already in place, it would be much simpler to build roads that could charge electric cars as they drive. Tuan isn’t proposing a nationwide de-icing program any time soon. Initially, it would make more sense for high-usage areas, like bridges or highway ramps. But hey, anything that reduces the thousands of tons of salt poured on roadways per year would be a major breakthrough on its own.